Instagram is an amazing place to grow your business, but you need to have the basics down first. 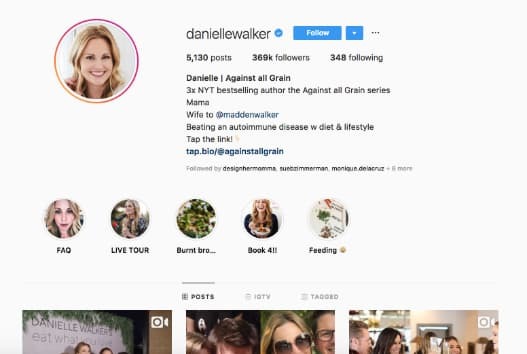 I’m going to give you the lowdown on everything you need to know to feel comfortable on Instagram. Building a strong foundation on Instagram starts with the basics. How can you gain more followers or build brand awareness if you don’t have a grasp on how to set up your business account or strategies for hashtags? 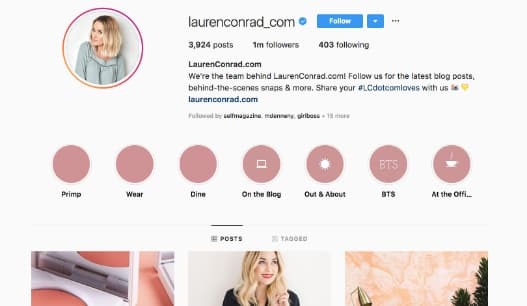 That’s why in this blog post, I’m sharing the eight Instagram basics every brand, business or marketer needs to know. 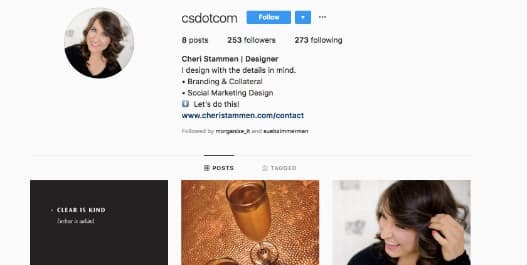 Putting time and thought into setting up your Instagram profile is one of the best first steps you can take for your Instagram strategy. 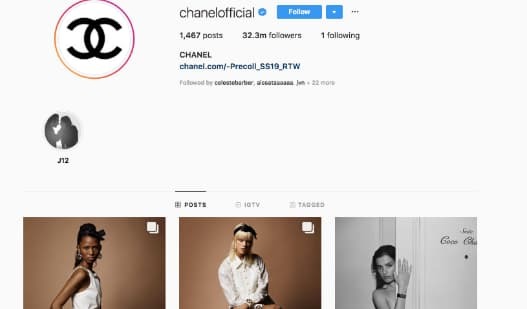 Even if you feel like an Instagram pro, it’s worth giving your account a once over to make sure your account is designed to expand your reach and connect with your followers. Facebook: When you open the app, you can login via your Facebook account. 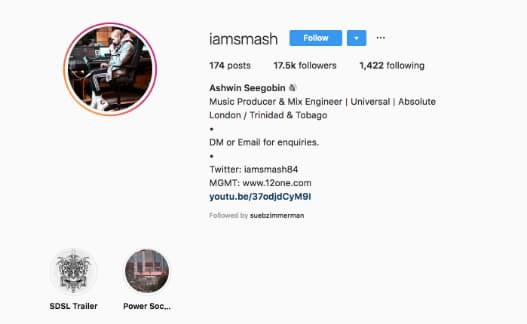 Phone number or email: If you prefer not to connect your Instagram account to Facebook, you can also sign up for an account with your phone number or email. Then, it’s time to pick your avatar. When someone looks at your profile, your avatar is the first thing they see. And you know what they say? You don’t get a second chance at a first impression. It seems like a simple task, but you want to make sure your avatar nails it on the first try. Keep in mind that your image is only 110×110 px, so you want to make sure the image is clear. If you’re a business, you might want to consider using your logo. This helps to build brand recognition and helps people to instantly recognize your branding aesthetic. 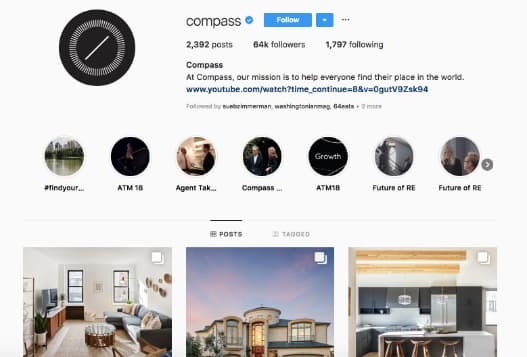 Just like Compass, a real estate company, does with their avatar. Alternatively, if your business is built on personal relationships you might want to use a headshot. Why? Because people love to know who they’re doing business with, and put a face to a name. This is a great example from Danielle Walker. Your subtitle, also known as your Instagram bio, should fit the overall aesthetic of your Instagram brand. Think of it as a billboard for your business. This is your chance to tell people who you are, what you’re offering and why you’re worth their follow. As such, make sure you add keyword in your subtitle that are relevant to your business. Consider adding details that explain who you are and what you do. 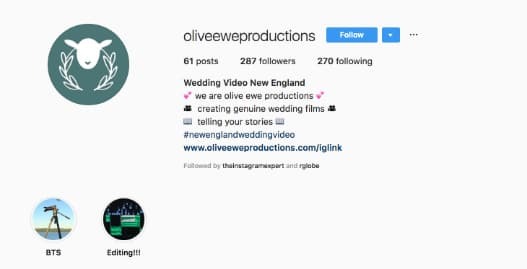 That’s exactly what @OliveEweProductions does for their Instagram bio. Their subtitle strikes a balance between explaining the services they offer and their greater brand mission. Plus, they also mention their brand hashtag (#NewEnglandWeddingVideo), so they expand their reach to more clients. Remember, your subtitle is also the only place you can put a permanent link. Well, unless your account meets the criteria for Instagram Stories. You can get the details on that here. But since this is the first link people see, you want to make it count. Are you interested in running ads? Or getting more analytics insights? Whatever the reason, switching to a business account is easy. First, tap on the three bars. Follow the prompts. That’s it! Not only can you run ads and see analytics when you switch to a business account, there’s a bunch of other perks. Now you can add your contact info, sell products and use quick replies in DM. When it comes to hashtags, people have a lot of opinions. Some people loathe them, and other people can’t get enough. But whatever your feelings about hashtags, the truth is that they are proven to help with engagement. In fact, posts with at least one hashtag get 12.6% more engagement than posts without hashtags. 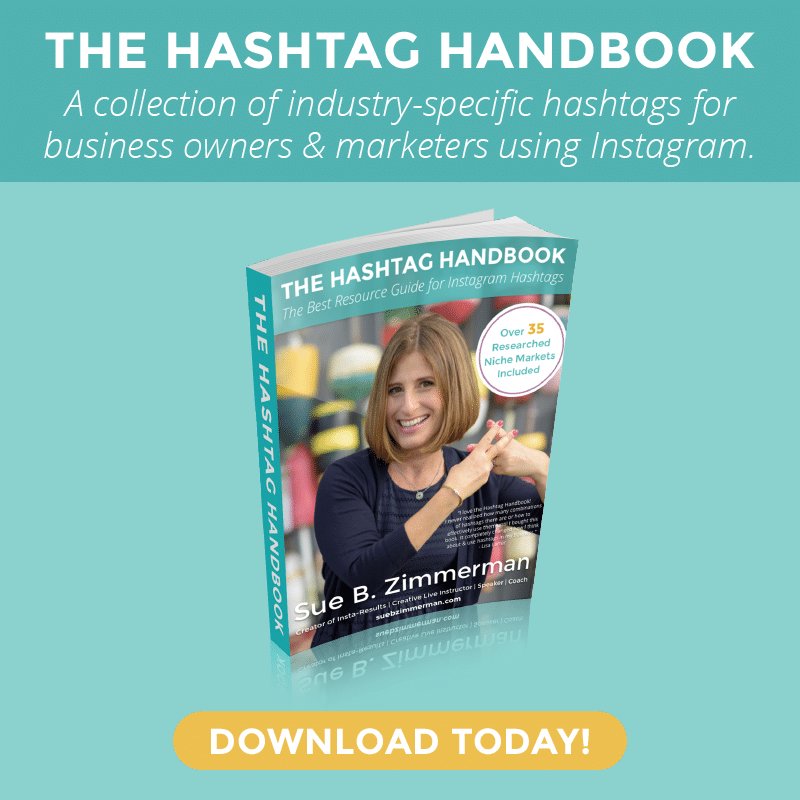 If you want to build an effective Instagram strategy, you need hashtags. Not only can you can see hashtag analytics in your insights, but last year Instagram added an update so you can follow hashtags. Still feeling the pangs of a hashtag headache? Not even sure which hashtags you should share? Don’t get too ahead of yourself. Start out by creating a list of keywords that you think are relevant to your business. 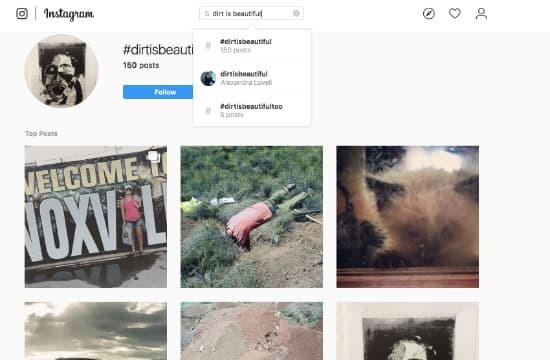 Then, explore Instagram to see how other people are using those keywords as hashtags. Take a look at the top nine posts in each hashtag hub. You might even discover other hashtags that are relevant to your business. If a hashtag is popular enough, you might even be discovered in Instagram Stories. Hashtag headache still strong? Find a cure with my hashtag handbook. It breaks down how to strategically use hashtags so you can get the attention of prospective customers and a list of hashtags to jumpstart your brainstorm. Do you ever feel like you just can’t think of anything to post? Or worse, your Instagram feed is just a bunch of random photos? Don’t worry! You’re not alone. I’m guessing that sometimes you’re scrambling at the last minute to post? Or you end up posting just to post? Chances are that the images you’re picking aren’t your best content or aligning with your brand theme. In other words, you need to plan ahead so you can have a cohesive feed. 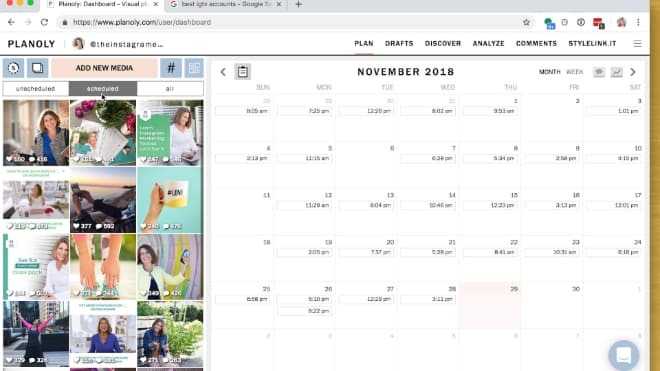 By creating a content calendar or curating all of your images in one place, you can avoid last minute photo decisions. 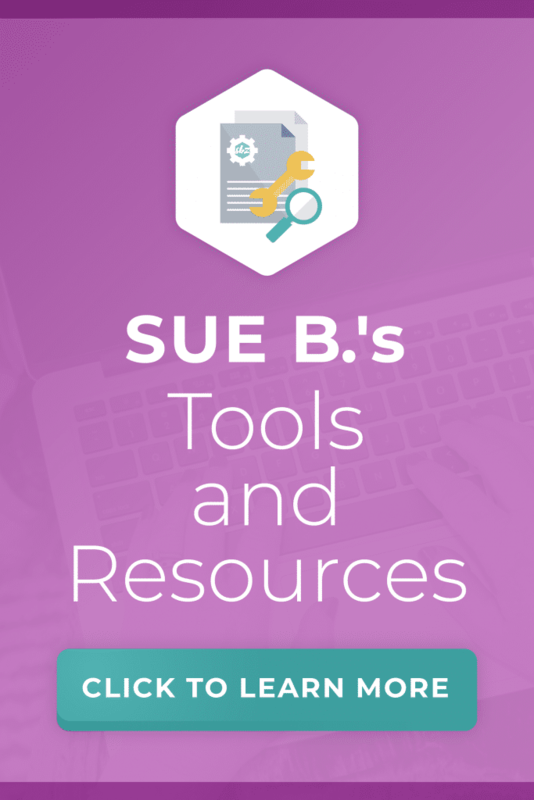 An app that really helps me and the SBZ curate our content is Planoly. I also suggest writing down the filter or theme you plan to use on your images. You don’t even need expensive photo editing software. If you have high-quality photos, you can make small adjustments right in the Instagram app. Last but not least, I recommend sharing a photo of yourself every ninth post. Sure, people will love what you offer, but sharing a quick intro about yourself is a smart way to personalize your brand. For example, Kim Rico, a stylist and creative director, has a great balance of promo and personal content. She always shares her introductions within context and in her brand voice. For instance, you’ll never see her standing against a stark white background or looking overly posed, but rather her introductions feel as warm and welcoming as the rest of her feed. 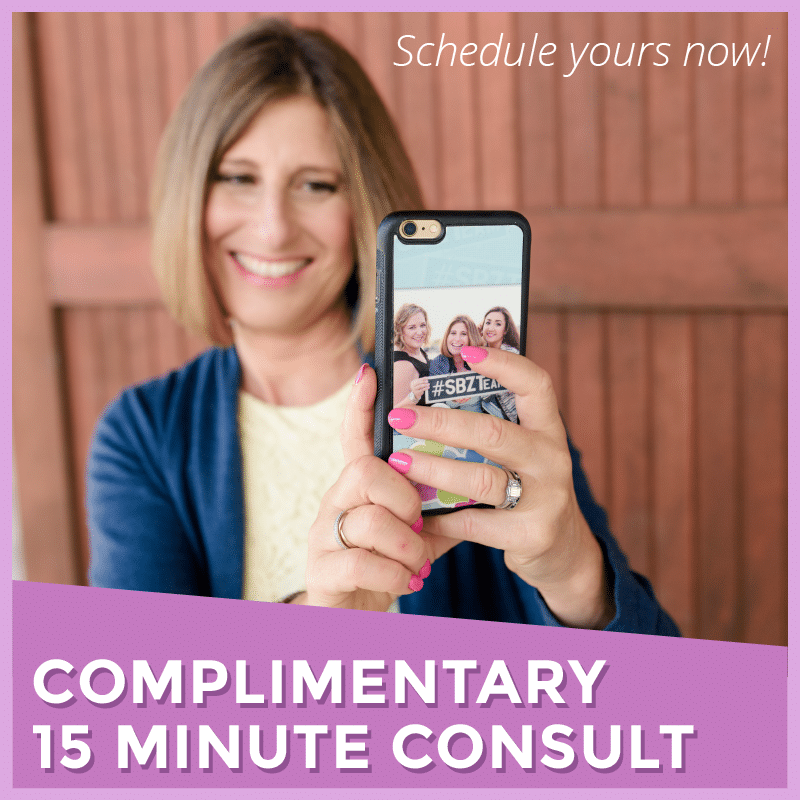 One of the most important parts of building your Instagram strategy is posting with a plan. While creating your content plan, consider if you want to share on other platforms. If you’re just starting out on Instagram, but already have a strong following on Facebook, it might be worth sharing your posts to other platforms. 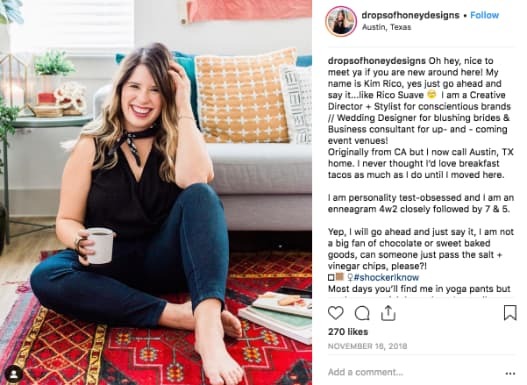 Ready to grow your Instagram marketing strategy in 2019? Download my free Instagram Strategy Guide to learn how you can start conversations with your followers, grow your online community and increase your revenue and profits using Instagram.